Tags: Antique Map, Asia, Ceylon, Sri Lanka. Antique Map Ceylon by Churchill titled ‘Insula Ceylan olim Taprobana nunc incolis Lankawn’. 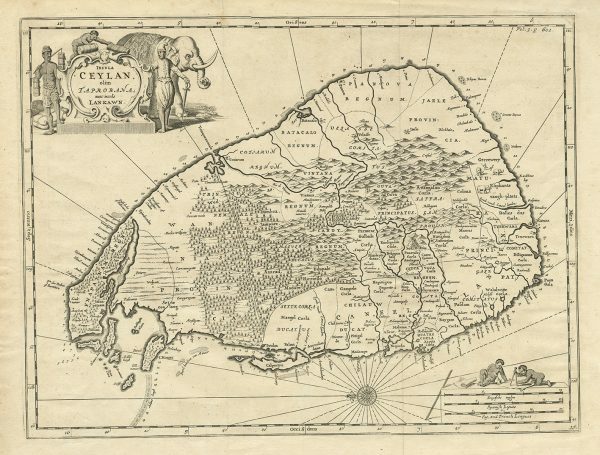 Rare and attractive map of Ceylon, nowadays Sri Lanka, published in England in 1732, from Awnsham Churchill’s, “A collection of voyages and travels”. The island of Ceylon shown oriented with east at the top. Two decorative cartousche embellish the map, which, a rarity for the time – shows depth soundings along all coasts. The small islands west of the Jaffna Peninsula are named after the Dutch city’s Amsterdam, Leyden, Middelburgh, Delft, Enckhuysen, and Hoorn.